The montage below displays some of my art work. The subject matter is drawn mostly from pictures of my travels and also from friends who kindly share terrific pictures of scenes in Canada and elsewhere. A friend living close by who has a beautiful and well-kept garden often shares pictures of how his garden is blooming and the various wildlife life visitors that pay visits during the spring and summer. I painted some of his lovely flowering plants as well as a raccoon intruder digging up his garden. While my art focuses mostly on nature scenes (gardens, landscapes and seascapes) due to my love of the outdoors, I also try to capture memories of poignant experiences while growing up in Guyana. 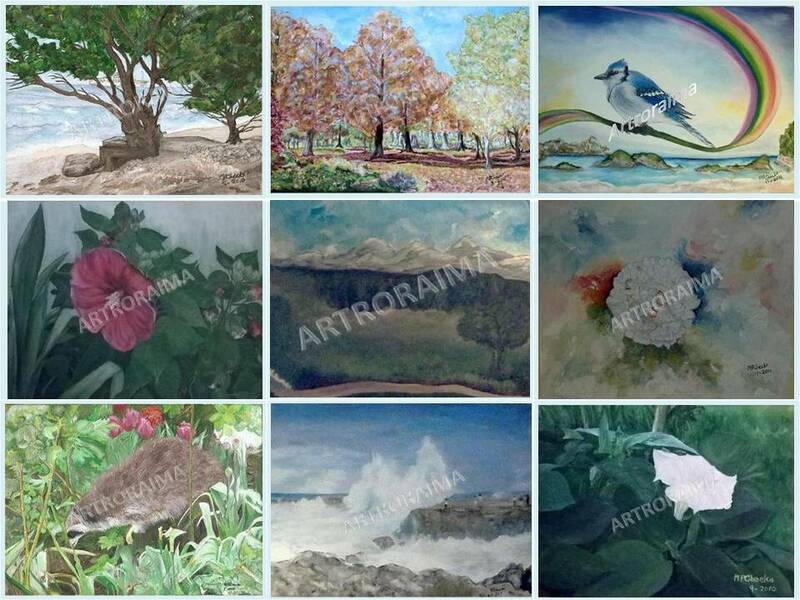 In order to view all the categories of my work you should check the “Gallery” tab. I very much enjoy working with other subjects such as still life, portraits, figures and also contemporary abstract art. Although my preference is for acrylics and watercolours I work occasionally with oils, pastels and charcoal. Feel free to leave a comment on any item that catches your fancy. You are also invited to join my mailing list by registering at the ‘follow’ icon located at the bottom right of the screen. By registering at the ‘follow’ icon you will be notified of my most recent works as soon as they are posted. 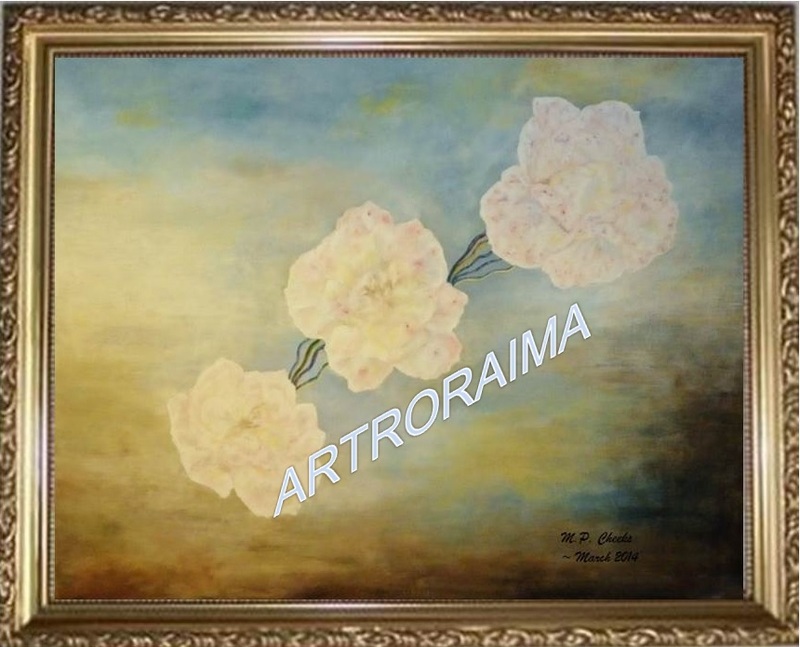 I was inspired to paint the images roses from a friend’s garden that had undergone a transformation. Initially I wanted to name this painting “A Rose For All Seasons” borrowing the title from that iconic movie “A Man For All Seasons”. That title wouldn’t be entirely accurate since the transformation barely occurs in one season. 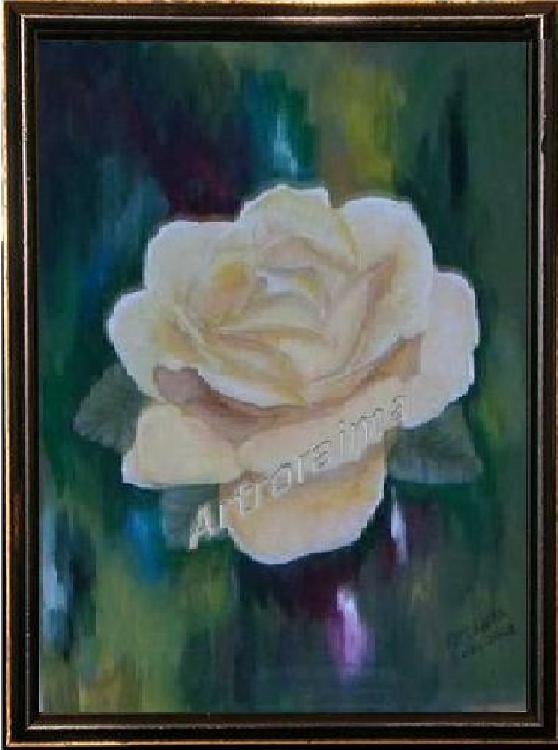 This painting captures the actual transformation that a rose had undergone last summer. Sometimes this transformation is attributed to roses that are hybrid or, in this case, to fluctuating weather conditions. This rose was affected by weather conditions and subsequently developed ‘water marks’. The ‘water marks’ on the rose were created after rain showers were followed by sunshine on the flower. Some people also attribute this transformation to the overnight dew on the petals that interacts with the sun the next day. I saw this transformation as an optimistic message that something special is about to unfold similar to positive changes that paralleled our own lives. I prefer to be philosophical and describe this transformation as a creation done by nature’s paintbrush. While growing up, art and music both played a major role in my life. This painting is an attempt to blend those two experiences… to re-awaken the memories of that creative time in my youth, a time when my mind was uncluttered. I have fond memories of playing the piano but I also recall some frustration while struggling with difficult compositions. Although I was fascinated by the sounds of all the musical instruments, it was the piano that captivated me. As I grew older I allowed myself to become lost in music as I dealt with the challenges of adolescence. Oddly enough, I recall the absence of nervousness when as kids we took exams administered by an overseas adjudicator from the Royal College of Music and also when we performed at concerts. That courage to play before a live audience has to be attributed to a dedicated music teacher who taught my sisters and I for years. 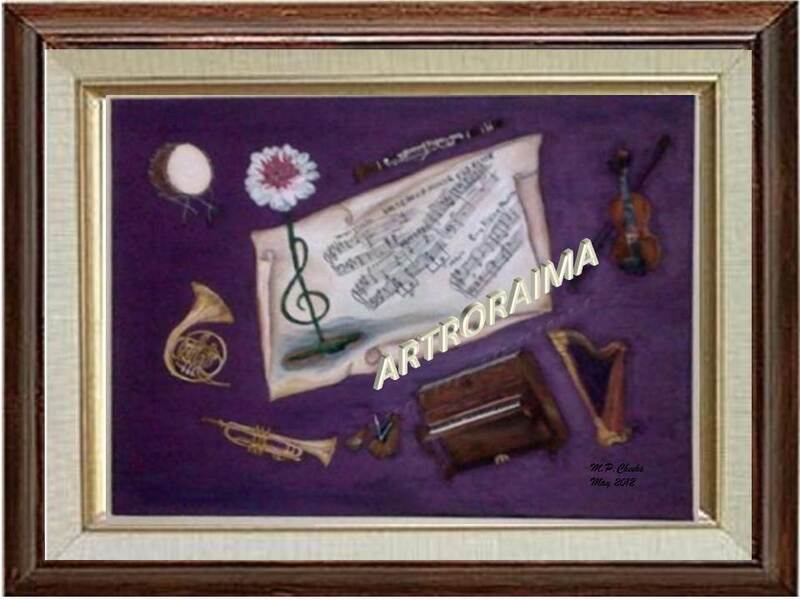 I have also included in my painting other musical instruments that captivated me but, alas, never had the opportunity to learn. The metronome had to be included as it brought back memories of the imp in me who wanted to take it apart as I did with so many of my toys …I had to find out how it made that ‘tick tock’ sound. Over the years I attended various performances featuring concerts, musicals, operas and solo performances so that those early experiences would not fade away. Tastes change but my fondness for the piano has remained. Since the piano was my instrument of choice it has been given a fairly prominent place in this painting. The inspiration for a purplish background in this painting came from the wood of the “Purple Heart” tree in Guyana. I felt that the purple background would be an effective contrast to the mostly golden brown colours of the instruments. The wood from the purple heart tree was sometimes used in furniture construction …I owe a special ‘thank you’ to a friend for the suggestion to use ‘purple heart’ as the background colour rather than my first preference of ‘green heart’. The Victoria Regia water lily is purposely intertwined with the treble clef on the scroll as a link to my early life in Guyana. It brings to mind the pride many Guyanese felt when we boasted about that elegant flower with those mammoth leaves floating in the pond at the Botanical Gardens in Georgetown as well in the interior regions. See http://en.wikipedia.org/wiki/Victoria_(plant). On the scroll I included a few fragments of music composed by some of my favourite composers … Chopin, Mozart, Brahms, and Beethoven. For me, this painting represents the lingering nostalgia from a creative period of my youth that I had to set aside in order to focus on academics. The intent was to capture memories of that particular period in my youth and translate those memories into something tangible to show how emotions can be expressed through the prism of art. Now that I am older it sometimes seems that life is a highly artistic musical dance that quite often becomes complex and challenging. Yet, as times marches on, I would like this dance, however complex or challenging, to last for a very long time!!! I was inspired to paint this yellow rose at the dawn of New Year being driven by an overwhelming sense of hope for 2012. We have had a lot of turbulence in the world whether it was tragic outcomes of political and social unrest, occupy movements, ongoing economic inequalities or devastation wrought by tsunamis, hurricanes, earthquakes, floods and not to forget various man-made disasters. Of course, it is mostly the economic turmoil that is still a major concern and which has left many in a state of fear and despair. What the world needs is a ‘movement for hope’ that can be translated into concrete actions and solutions to make the world a better place for all of us. In times of crisis, chaos and uncertainty it is better to invest in beauty so am doing my small part to push away those events and focus on generating “hope” with my latest painting …..” Yellow Rose of Hope“. So I juxtaposed the yellow rose against a vivid array of mostly dark colours in the background. That background is intended to capture the chaos and turbulence occurring in so many parts of the world. And that yellow rose is the focus of the painting so as to emphasize the need for us to embrace hope as we look to the future. Life is not perfect but we should try to stike a balance between the good, the bad and, yes, the boring. Despite so many chaotic events around the globe this past year and also personal setbacks let us not cave in to pessimism. Instead, let us contribute to a future that makes it worthwhile to wake up every day with a feeling that it is good to be alive another day. Let this rose be a symbol of hope and of new beginnings for the New Year.